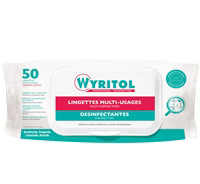 Specializing in professional disinfection for more than 20 years, used and recognized in medical circles, Wyritol has developed a complete range of products combining detergency and disinfection. For a perfect mastery of hygiene with simple solutions. Contamination risks are a major health issue and are constantly evolving. We face you with no concessions to hygiene. • 200,000 French people suffering from food-borne diseases each year due to bacteria contained in food (salmonellosis, staphylococcus, listeriosis for the most well-known). Our formulas meet European disinfection standards for guaranteed antimicrobial efficacy. Our products are integrated with the HACCP method as well as all protocols and hygiene plans. We guarantee the regulatory compliance of our products as well as the traceability of each batch. Past standards, dilutions, contact times and directions for use are precisely detailed on each product. Our bilingual French-English packagings are readable by all users. we support your performance in hygiene control.